In the top compartment: On the right, Moses, with Aaron standing behind him, is sprinkling ashes. 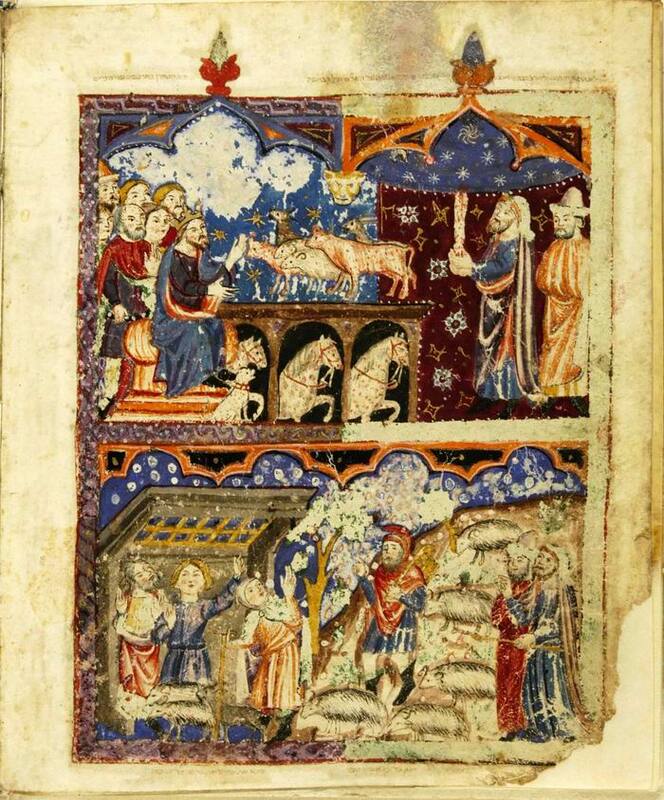 On the left Pharaoh is sitting, crowned and enthroned, in front of his magicians and pointing at horses and cattle in a stable; a dog sits at his feet. The Egyptians and the animals are all covered with red boils. Inscribed with Ex. 9:8-9, 11. — In the lower compartment: Moses, holding his golden rod, is standing on the right, together with Aaron, on one side of a herd of sheep. Beyond the sheep are a shepherd waring a cap and a tree. On the left, three more shepherds are standing with hands raised inside a house with a coffered ceiling, sheltering from the large white hailstones. Inscribed with Ex. 9:20, 24-25.